The Saturday and Sunday July meetings would probably be described by most as the meeting of the year! 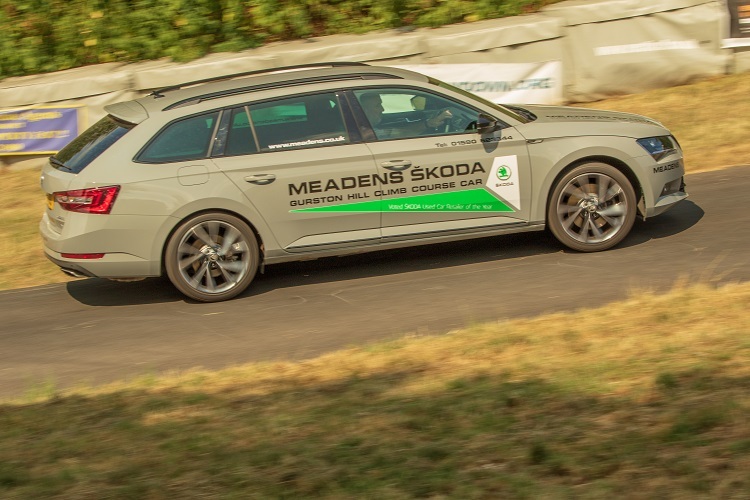 The events were part of the Meadens Skoda Gurston Down Championship and of the Cavendish Ships Stores Top Ten Challenge. The four rounds of the Championship and two rounds of the Challenge pretty much decided championship positions. More on that in a later report. We had just over 100 cars and drivers, competing on both days. 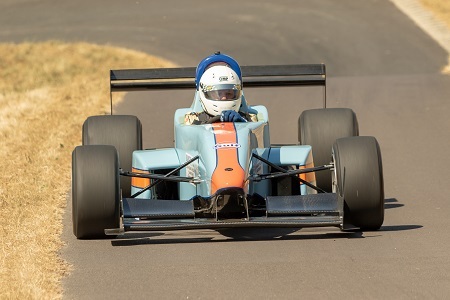 The weather was superb and very conducive to class records and personal bests, particularly on Saturday when the air temperature was a little lower. 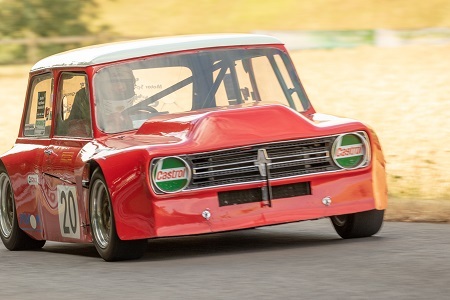 Robert Wood in his Lotus Cortina and Dave Rayner in his Caterham 7 were the only two entrants in the class. 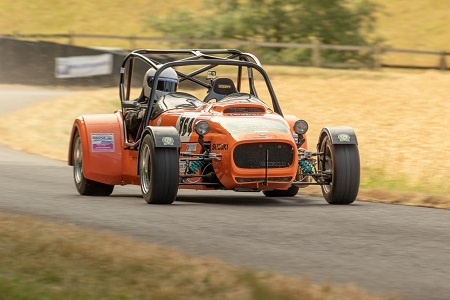 With the lighter and more powerful Caterham won the class and a new class record, finishing on 38.75s. 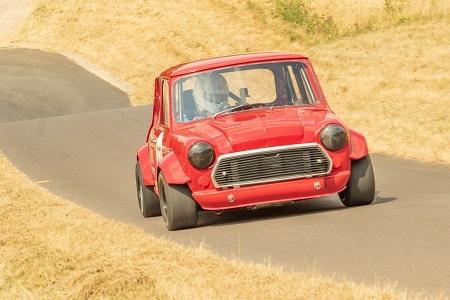 Then it was the turn of eclectic cars of the DEWS Motor Club Class. 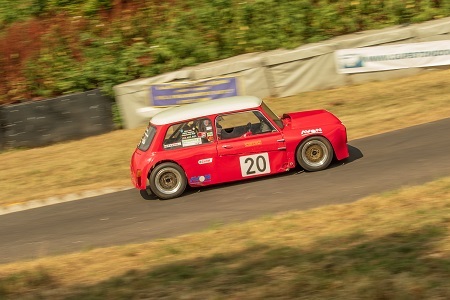 This class again went to form, Derek Kessell in the gorgeous and fast Maguire Mini took the win finishing on 36.62s. Second was Marc Morris in his Renault Clio on 39.97s and third Lee Kessell on 41.27s. This class seems to have a surprising knack of pulling some very competitive racing and unsurprising Saturday wasn’t any different. Jason Richardson and Mark Crookall have been swapping places for most of the season. Jason took the lead in the first timed run which he kept in the second. His times were just 0.02s different between his runs and he finished on 40.46s. 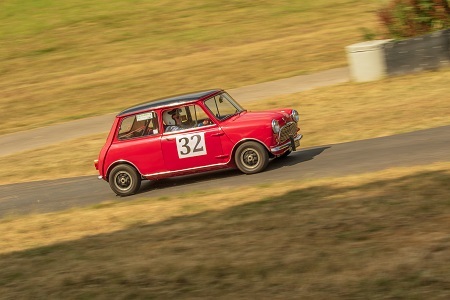 David Nutland and his Mini and John Davey, the managing director of Cavendish Ships Stores, our Top Ten Challenge sponsor, in his MG Midget were the two runners in this class. John was having issues with the car all weekend and could repeat his June wins. David putting in two very consistent runs of 41.73s and 41.79s. There was a big entry in this class. Paul Dickinson in his Honda S2000 was already in a strong position in both the overall championship and class championship but more on that later. However, Tim Foster didn’t let Paul have it all his own way. 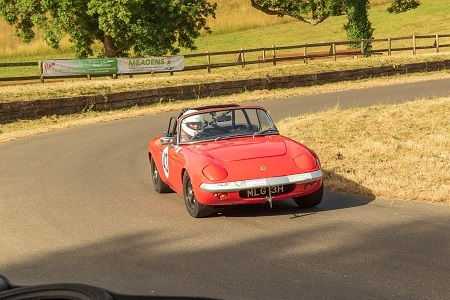 Tim and his Lotus Elan put a very quick second timed run and finished the day on 37.75s with Paul’s 37.89s first timed run giving him second and Dean Cubitt and his Mazda MX5 third on 38.29s. 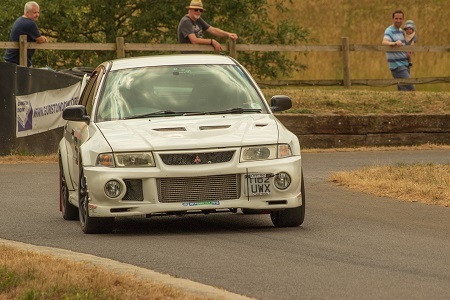 Simon Neve in his Mitsubishi Evo pretty much took charge of this class from the outset. The first timed run produced some interesting results. Sarah Fudge in the Subaru Impreza she shares with her husband Shaun put in a great time pipping Shaun for the first time by 0.08s! Jon Maycock in his Mazda MX5 was second after a great 36.43s run. Shaun was third with a 37.25s second timed run. 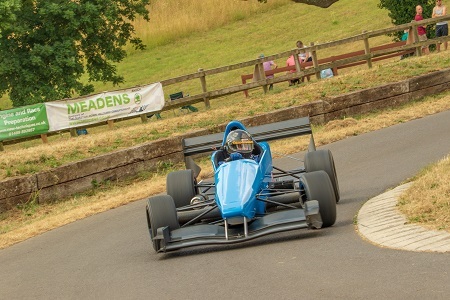 Adrian Lewis and his Westfield Superbusa was pushed very hard by both Clive Skipper in his Caterham and Anthony Orchard who was sharing Adrian’s car. It looked like it could be anyone’s class with them separated by just 0.43s after the first timed run. But Anthony was the only one to improve his time in the second timed run but it wasn’t enough to take second from Clive. Adrian finished on 34.41s, Clive on 34.59s and Anthony on 24.78s. 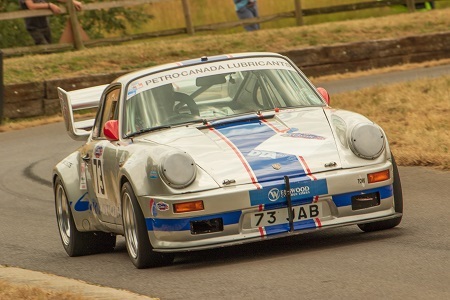 Neil Turner, the class record holder and class championship leader was on good form, breaking the class record which now stands at 35.14s and taking the class win. However a second timed run wasn’t to be after an engine that decided to let go. This class is becoming one of those classes that is increasing competitive this season. 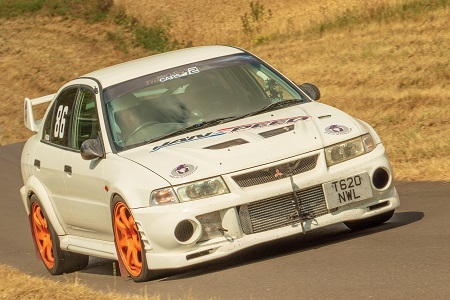 Stephen Moore in his Mitsubishi Evo RS fought hard to take the win from Tim Painter and the Aston Martin Vantage he shares with Andrew Fraser. Stephen took the win on 34.74s, Tim second on 35.03s and Andrew third on 36.03s. 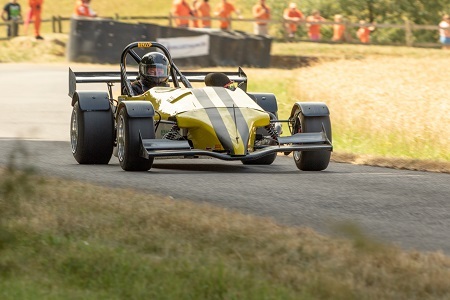 This was another very close class, Martin Watson in his Westfield took the class win with a 32.31s run but it was close. 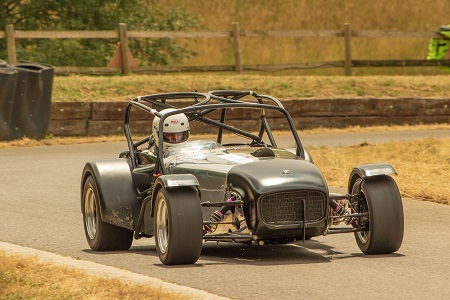 Second, Steve Holland in his Caterham and, third, Richie Gatt in his Westfield just 0.18s and 0.25s adrift respectively. Fryth Crosse and the Dempster Ensign LNF3 took the class with a 33.81s from Sue Hayes and her Palliser WDF3. 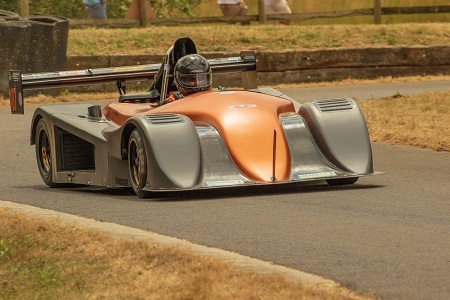 Peter Steel in his Mallock took the class win here and a new class record with a 33.89s second timed run. Needless to say Pete was very pleased with the result! Chris Cannell with the Force SR8 was they only entry in this class but he is looking for Cavendish Ships Stores Top Ten Challenge points, rather than championship points. James Moore and his Empire Evo 2 took the win in this class. The class was very close with the first five separated by 1.5s. James’ time 31.34s followed by Tony Levitt in the Empire Evo on 32.08s. 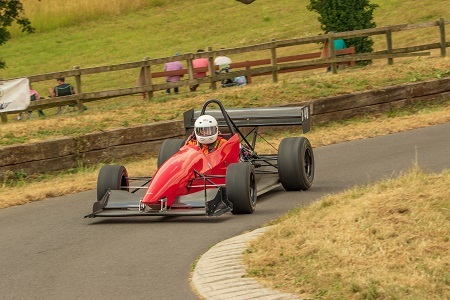 Saturday’s was the first of the two day Gurston Down Formula Ford Festival. The win was taken by Shaun Macklin in his Swift SC92 with a class record breaking time of 36.22s. The former record holder, Simon McBeath in another Swift was second on 36.70s. Peter D Smith took this class and Fastest Time of the Day. He also took the lead in the Cavendish Ships Stores Top Ten Challenge. It was also the first time Peter had done a sub-30 second run. He finished on 29.68s. 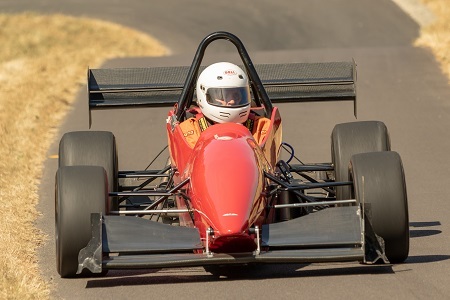 Paul Crute in the Jaguar power OMS 28 took the class win with a 29.76s run with Tim Elmer in his Dallara F399 secomd on 30.83s. 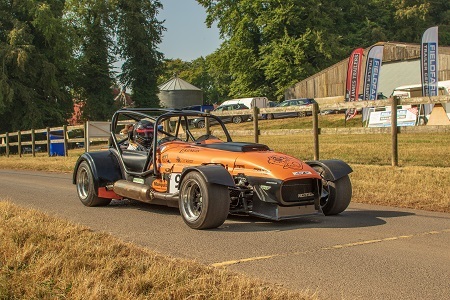 There was an additional entrant, Toby Galbraith with his Subaru Impreza and he pushed Saturday’s winner Dave Rayner in his Caterham 7 very hard. Dave didn’t hold back and not only did he win the class but he set a new class record again, this time 38.47s. 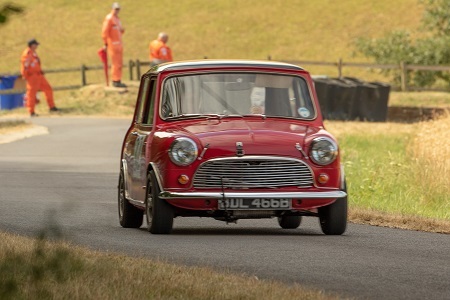 Derek Kessell in the Maguire Mini repeated his Saturday win with a 37.20s and Marc Morris in his Renault Clio was second matching his previous days time of 39.97s. 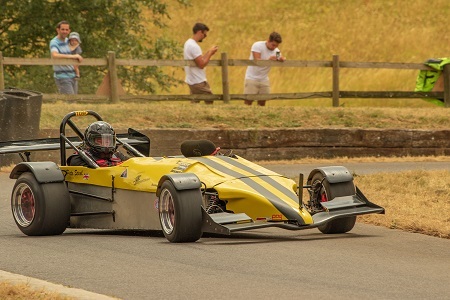 Third was Paul Denning in a Morgan 4/4 on 40.49 with Lee Kessell fourth on 40.69s. This class had been a class to watch all weekend. Sunday produced some stunning performances. 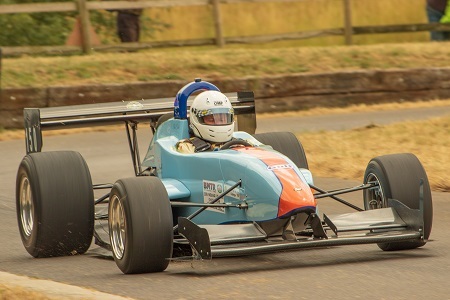 The current record holder and class champion, Mark Crookall reset the record by a significant margin. The record now stands at 39.88s. Unsurprisingly, he took the class win. Jason Richardson just couldn’t match Mark’s pace today. Jason finished with a first timed run of 40.77s. David Nutland and his Mini completed the double over John Davey, the managing director of Cavendish Ships Stores, our Top Ten Challenge sponsor, in his MG Midget. David time was 41.84s. 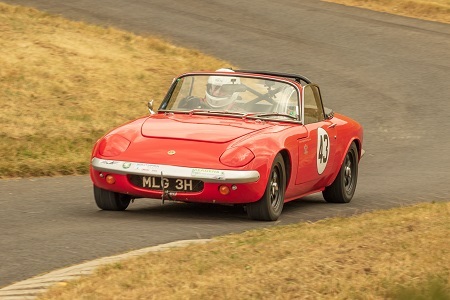 This was Tim Foster and his Lotus Elan’s class again today. This time by the closest of margins, 0.01s over Paul Dickinson in his S2000. Tim’s time was 37.87s and Paul’s 37.88s. 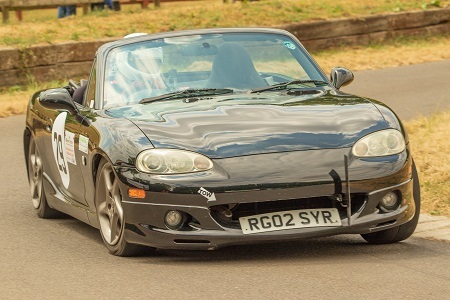 It wasn’t just the first two places that were close, Dean Cubitt and his Mazda MX5 was just 0.06s behind Paul. That probably equates to less than 30cm over a 967m run! Simon Neve in his Mitsubishi Evo put his stanp on the Sunday event too. 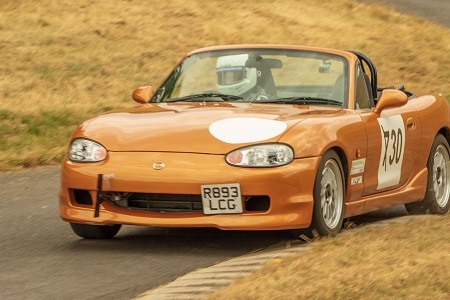 He finished on 34.54s with Jon Maycock in the Mazda MX5 second on 36.35s (a personal best) and Andrew Thorp in his Porsche Cayman S third on 37.28s. 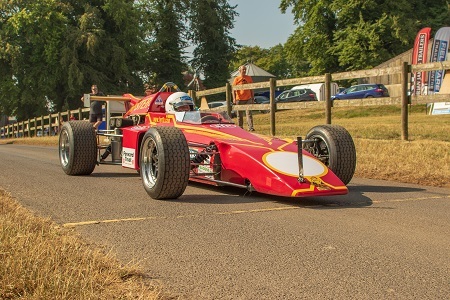 Anthony Orchard and Clive Skipper really pushed Adrian Lewis and his Westfield Superbusa hard to a 33.76s second timed run. The first three were again just separated by just 0.5s, although this time Anthony was second, 34.20s and Clive third on 34.25s. Andrew Hurle in his Sylva Phoenix ran alone in this class and put in a 39.15s run. The sunday timed runs were almost a repeat of the Saturday timed runs. 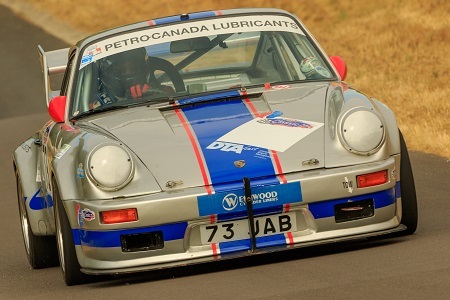 Phil Price in his Porsche 911RS put in another great performance. Graham Beale and his Ginetta pushed him very hard improving his time from the previous day. Phil’s second timed run was 34.01s and Graham on 34.34s. The up to 1400cc Modified Series Production Class. 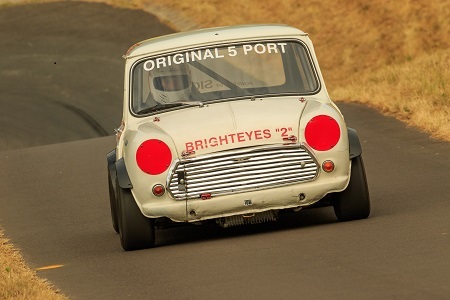 Derek Mullis in his Mini took the win with a 38.87s beating David Bean’s Rover Mini. 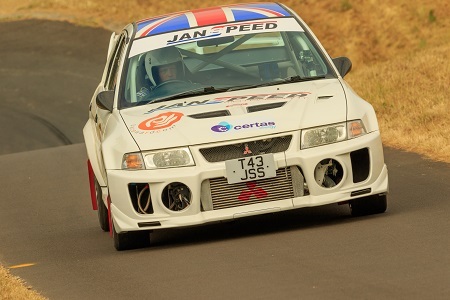 Stephen Moore in his Mitsubishi Evo RS was in sparkling form today. His second timed run of 32.95s took a class win by a great margin. A great performance leaving Tim Painter and the Aston Martin Vantage he shares with Andrew Fraser trailing in his wake! 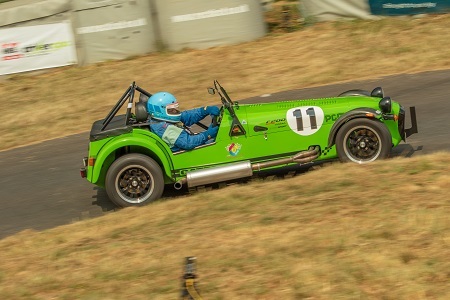 This was another very close class, Martin Watson in his Westfield had taken the class win on Saturday but with a class as competative as this, it would be a tough call to do it twice in a weekend. 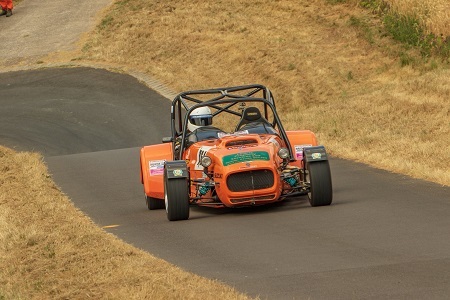 Steve Holland in his Caterham took the win with a 32.07s with Martin just 0.09s behind on 32.16s. 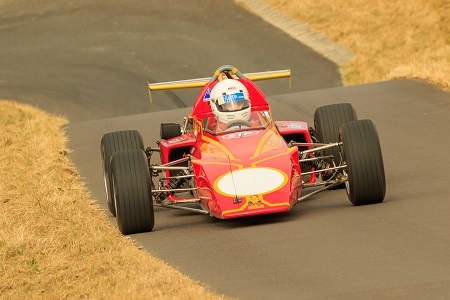 Richie Gatt in his Westfield was third after a bit of an issue on the second timed run. Fryth Crosse and the Dempster Ensign LNF3 repeated his Saturday win with a 33.12s first timed run beating Sue Hayes and her Palliser WDF3. 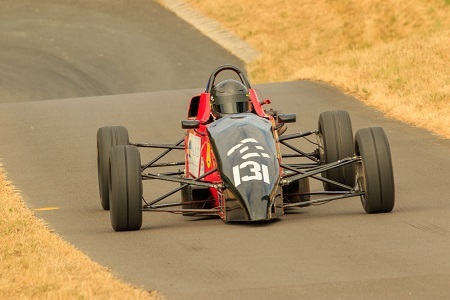 Peter Steel in his Mallock had a great weekend. Not only did he take the class again but he reset the class record too! His time was 33.73s! James Moore and his Empire Evo 2 took the win in this class with a 31.48s first timed run. He fended off Murry Wakeham in the OMS who finished on 32.62s. 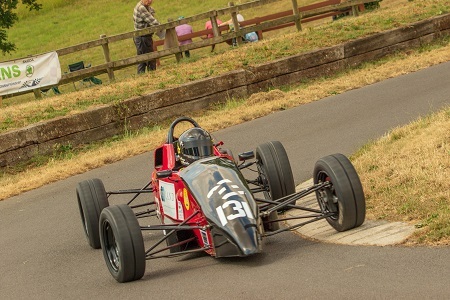 Sunday was the second of the two day Gurston Down Formula Ford Festival. Not only did Shaun Macklin in his Swift SC92 take the class win for the second day and he set another new class record, at 35.81s. Simon McBeath in another Swift was second on 36.50s. 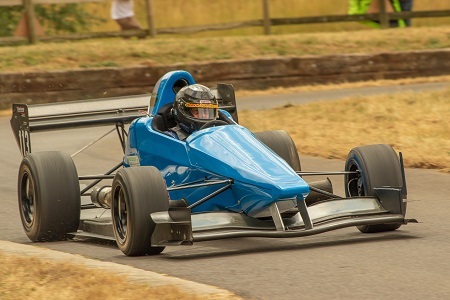 Paul Crute in the Jaguar power OMS 28 took the class win with a 30.19s run with Tim Elmer in his Dallara F399 secomd on 30.63s.